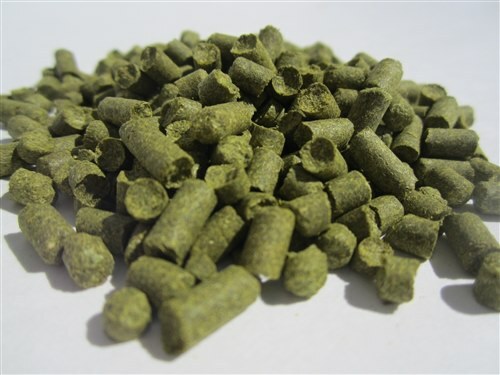 All Brew for Africa hops are vacuum packed in multi-layer barrier foil to retain freshness, and come in the form of hop pellets unless otherwise noted. South Africa's latest high alpha acid flavour hop that everyone is wild about. It has an extremely well balanced, unusually flavourful profile with complex fruity aromas reminiscent of passion fruit, supplemented with subtle notes of cassis and a hint of chili. Its combination of intense flavour and high bitterness make it very suitable for single-hop beers. Alpha acids typically 12-14%. The American Cascade hop has a very distinct aroma of medium strength. It has a pleasant, flowery and spicy, citrus-like quality with a slight grapefruit characteristic. Primarily used as both a flavor and aroma hop, but also suitable for bittering. Can be used to make any ale, and indeed is characteristic of American Pale Ale. It is also used in some lagers. One of the "three C's", Centennial is a popular American hop. This aromatic dual-purpose variety is similar in character to Cascade and Chinook, and is sometimes referred to as "Super Cascade", since it has a very strong citrus aroma. Alpha acids typically 9.5-11.5%. A branded American hop cultivar which was introduced to the market in 2007. This dual-purpose hop has a fairly high Alpha acids and total oil precentage which impart intense citrus (grapefruit) flavours and tropical fruit characters to a wide range of American beer styles. Alpha acids typically 11-13%. Citra is a registered trademark of Hop Breeding Company LLC. This American hop ranks high on the bitterness scale. Primarily a bittering hop, it is also valued for its oil content which creates a hop aroma that is an interesting dichotomy of sharp and herbal. Columbus has a pungent aroma and clean bittering. Excellent for bitter ales and American IPA styles. Alpha acids typically 14-17%. East Kent Goldings (EKG) hop is a group of traditional and very popular English aroma hops used in a wide range of beer styles, but also works well when used as a bittering hop. This hop is called East Kent Goldings if grown in East Kent, Kent Goldings if grown in mid-Kent, and Goldings if grown elsewhere in the U.K. (Note: Styrian Goldings is not of this family and is closer to Fuggles in character.) East Kent Goldings tends to have a smooth, sweet flavour. Alpha acids typically 4-5.5%. Fuggles hop is a main English variety, earthier and less sweet than Goldings. Traditionally used in English style ales. Can be used as both aroma and bittering hop. Alpha acids typically 4-6%. Hallertauer Perle is a versatile German dual-purpose hop which is very popular in many European styles including lagers, Pilseners and strong lagers (both for bittering and flavouring) but is also used frequently as a fine bittering hop in many English, Irish and English ales. Perle has a well-balanced character with medium bitterness and a mild to moderate flavour and aroma with pleasing elements of spice and pepper and subtle minty, evergreen, and woody/earthy elements topped off with subtle hints of green fruit, light florals, and tea. It is a popular substitute for the English Target and Northern Brewer varietals. Alpha acids typically 8-9%. A noble hop originating from Germany. It is famous for its use in Bavarian style lagers and Weissbiers, and known for its mellow yet slightly spicy aroma, subtle fruity character and low bitterness. Alpha Acids typically 3-5%. The famous European noble aroma/flavouring hop, originating from the Saaz region in the Czech Republic. Best known for its characteristic presence in light German, Bohemian and Czech beer styles (most notably lagers and Pilsners) but also a staple of many Belgian ales. Alpha acids typically 2.5-4%. This relatively new South African hop variety is used by the largest commercial brewery in South Africa. An aroma hop with a flavour profile reminiscent of sunny hayfields, field flowers and dried herbs. The pronounced floral and herbal notes linger on the palate. Alpha acids typically 3.6-4%. A relatively new South African hop, used by the largest commercial brewery in South Africa. A dual purpose hop, suitable as both a clean bittering hop and as an aroma hop. Southern Dawn has many similarities to Southern Promise, but is more aromatic. When used as a bittering hop, it is slightly more astringent than Southern Star. Alpha acids typically around 11%. Southern Passion is cultivated on the Outeniqua pass in the George region of South Africa, and is the most flavoured South African hop strain currently available. It is primarily an aroma hop, and has some of the same qualities as the noble hops from which it was developed (Saaz and Hallertauer) but is a little more earthy and spicy with pronounced grassy notes. The aroma profile also includes passion fruit (granadilla), guava, red berries, melon, calendula, and grapefruit. This very unique hop works very well in specialty lagers, American ales, and various Belgian styles. Alpha acids typically 6% - 7%. A South African hop, internationally renowned but also ideally suited for typical South African beers. Southern Promise hops are mild, pleasant and aromatic, with some earthy, woody notes on the nose. This dual-purpose variety is excellently suited for use as a fine bittering hop, but also as an flavour, aroma and finishing hop. Alpha acids typically 9.5% - 11.5%. A South African hop, internationally renowned but also ideally suited for typical South African beers. A clean, high AA bittering hop with subtle flavours of soft stone fruits, fresh cut flowers, mint and savory spices and a hint of pepper. Slightly less astringent than Southern Dawn. Alpha acids typically 14% - 18%. A neutral mixture of bittering hops. Used by the largest brewery in South Africa. Blended for a constant, predictable Alpha Acid content of about 12% regardless of crop variation. Perhaps the most popular of aroma hops in the U.S. and a favorite among American craft and home brewers. Willamette has a modest bittering value and a rich blend of flowery, fruity, earthy and spicy notes. This hop varietal can adapt to many different American beer styles and add a lot of great character. Alpha acids typically 4-6%. A new, experimental South African hop variety. This high bitterness hop is ideal for the brewing of African Pale Ales, and has aromas of citrus, passion fruit and orange, ginger and pine. Alpha acid content typically 12-14%.